I wish I could post pics of Chloe's reupholstered chair...but I can't...because it isn't finished. Oh, the troubles that chair is giving me! First we tried using a staple gun to affix the plygrip metal fastener. Nope, our air compressor staple gun didn't have enough kick and the staples wouldn't go all the way into the wood. Then we tried a nail gun. That worked a bit better - until the nails ripped through the metal as I fidgeted with the fabric! And then, I had to figure out a way to prevent the plygrip from poking through the edges of the fabric. So we're left back at square one. I will reupholster this chair, mark my words! Let's just think of pretty happy things instead, shall we? 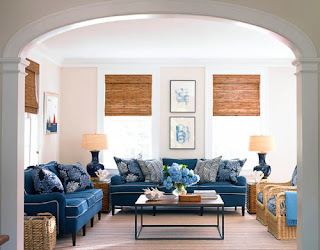 Like these rooms with lovely hits of blue. Love these rooms - especially the bedroom! That day bed is beautiful! You can do it. Slow and steady wins the race. One of the pictures you posted shows a pair of chairs that have wooden balls carved out of the woodwork. It is my dream in life to have a pair of chairs like that.